The Karri Forest at Boranup is small and isolated from the larger Karri forests, a hundred kilometres to the east. It nestles behind the Leeuwin Ridge and is just one of many remarkable surprises encountered in the Leeuwin-Naturaliste National Park. Close proximity to the coast enabled logging of the Karri forest to take place very early in the development of the colony of Western Australia. MC Davies’ Karri and Jarrah Company started logging around Karridale in 1880. Over the next 30 years they built three timber mills, several townships and laid extensive rail networks through the forest to haul timber to the mills, and to the jetty’s at Hamblin Bay and Flinders Bay. Logging ceased in 1913 when all but the most inaccessible stands of Karri had been felled. Since then, the forest at Boranup has been allowed to re-grow, and though barely 2 kilometres wide and 13 kilometres in length, the karri has managed to regenerate and form a pocket sized Karri forest. The forest is criss-crossed by numerous tracks and these can be used to make easy, though rewarding, circular walks of varying length. The walk described below is just one of them. The walk starts and finishes at Lovespring road, just off Boranup Drive, and follows well defined tracks through re-grown Karri forest and some peppermint and banksia woodland. It forms a 15 kilometre circuit and takes 4 to 5 hours to complete. This map of Boranup Karri Forest shows the route. From Margaret River, drive west along Wallcliffe Road and then follow Caves Road south for 18 kilometres to Boranup Drive; this is 3 kilometres past Conto’s Road and half a kilometre past the Karri forest scenic view point. (Boranup Drive is signposted, but the sign is small and easily missed). Turn down Boranup Drive and continue for a further kilometre to Lovespring Road. The sign indicating Lovespring road is not visible from Boranup Drive, but the junction is at a sweeping right angle bend on Boranup Drive. Two short tracks either side of the bend lead to Lovespring Road; the second track is the smoothest. Park in the small car park opposite the sign. The track to the south is Formation Road. This is where you'll come out at the end of the walk. Start of the walk - Lovespring Road to Point Road 2 kms. Walk north west up Lovespring Road for 2 kilometres, to the junction with Davies Road. Continue north along Davies Road, for a further 120 metres, to Point Road. Both these tracks are four wheel drive tracks and though little used you may encounter vehicles. At Point Road, turn left and follow the track north west. This track leads to Point Road campsite so may carry some four wheel drive traffic. About 200 metres up the road you’ll pass a track leading south. This is an old track that runs parallel to Davies road. It’s not used anymore and is very overgrown in places. Georgette Road is signposted and it’s here that you’ll join up with the Cape to Cape track. If you want to make use of the picnic tables at Point Road campsite, they are just a further two hundred metres up Point Road. Follow the Cape to Cape track south east down Georgette road. Once again, Georgette Road is a four wheel drive track and though little used, you may encounter some vehicles. The tall Karri soon gives way to Marri trees (Corymbia calophylla), and, as the track rises, this in turn gives way to mallee, peppermint trees and Banksia. 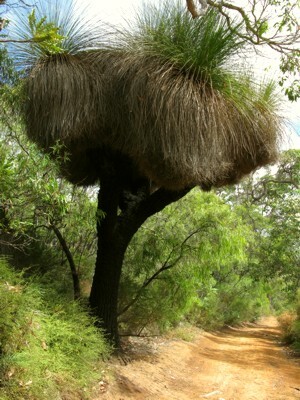 There are also some magnificent grass trees (Xanthorrhoea preissii) along here. After a kilometre you’ll come to Brozie Road. The Cape to Cape track turns east here to return to the Karri forest. Continue straight on, along Georgette road; you’ll meet up with the Cape to Cape track again on your return. The next track you cross is Donovan Road and after this Hooley Road. As you can see from the map, either of these tracks can be used to shorten the walk if you find you’re running out of time. After about 2 hours of walking, you arrive at Trig Road and rejoin the Cape to Cape track. At Trig Road descend to the east, and head back to the Karri forest. After half a kilometre you cross the old track running parallel to Davies Road that you encountered earlier in the day. 200 metres beyond this you come to Davies Road. Follow the Cape to Cape track sign posts and head north west up Davies Road. Davies Road, as part of the Cape to Cape track, is a walk track, so you shouldn’t encounter any vehicles up here. After a kilometre and a half you’ll find a small clearing on the right hand side of the track, sometimes used by Cape to Cape walkers as an overnight camp . Half a kilometre beyond this you come to Hooley Road. At Hooley Road leave the Cape to Cape track (which continues north along Davies Road), and walk north east along Hooley Road for 200 metres to the top of a small hill where a track heads north. This is Formation Road, the course of an old logging railway that will lead you back to Lovespring Road. The walk along Formation Road takes you through tall karri trees with an under-storey of dense karri hazel. Over the first kilometre you’ll pass through an old bush landing, an earth cutting where felled logs were hauled on to the railway wagons. Cross Donovan road and continue north for a further kilometre to arrive back at your starting point at Love Spring Road. The small car park at Lovespring Road is a good starting point to further explore Boranup Forest. Several circuits can be made from here, including a walk down Formation Road and Hooley Road to the coast and then up south beach and returning via Brozie Road.The map of Boranup Karri Forest shows some of these walks. Cape to Cape publications has produced several excellent books by Jane Scott and others, that detail many walks and give much valuable information on the wildflowers of the Leeuwin-Naturaliste region. Any time of the year is good to visit though care is required if you are planning to walk a stretch of the coastline in winter. The weather can be rough at any time of the year, but especially so in winter.